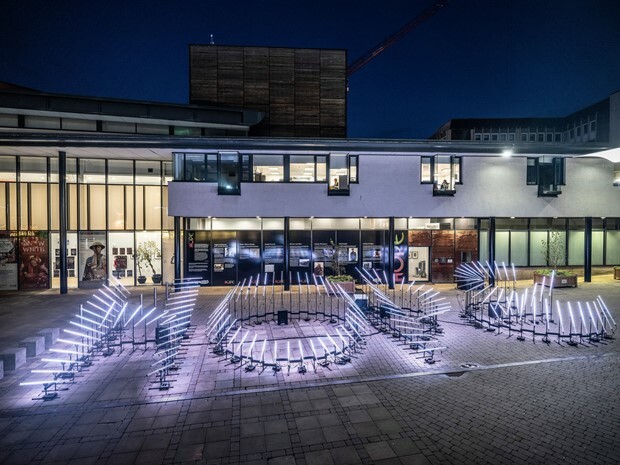 Aether & Hemera’s diverse works – in lighting sculpture, video, and installation - have been exhibited nationally and internationally in galleries, festivals, public areas and arts centres. In 2010 they were awarded an R&D grant from Arts Council England to create Growing Forest, an interactive video projection featuring a bespoke software application to render algorithmic-based trees customised on the audio input signals from the public. It was shown at the Shed Open Studios in Gateshead and then travelled to various venues, including Blinc Digital Fest, Wales in 2012 and Kinetica Art Fair, London in 2013. The Colour of Phi created in 2011 for the DLI Museum and Gallery in Durham, used the mathematical concept of the golden ratio to draw in space with light; the piece was then selected to be part of the Aesthetica Anthology (2013) - 100 Contemporary Artists. Which is your brass’s voice? was displayed in a pop-up space for the International Brass Festival in Durham in 2012; it created a cycle of interaction that transformed viewers into active performers, immersing them in an ambience consisting of sound, lights and real-time processing. In 2013 it travelled to various venues, including ArtsIt at Hangar Bicocca in Milan and Vivid Festival in Sydney. The artwork’s behaviour was entirely based on the involvement of the public thus embodying interaction and encouraging social participation. In 2013 they were awarded an Arts Council England’s fund to collaborate with Dr. Kevin Hilton on the project Fluidity, an interactive installation visualising the ‘gender experiences’ of participants in real-time, using QR codes in Newcastle City Library; departing from the binary logic of gender representation and questioning pre-assumptions, it stimulates discussion around gender identity. In 2016, they worked on the Generation Touring exhibition across four visual arts venues in the North of England with inspiring, thought provoking and engaging artworks that enable interaction from family audiences. 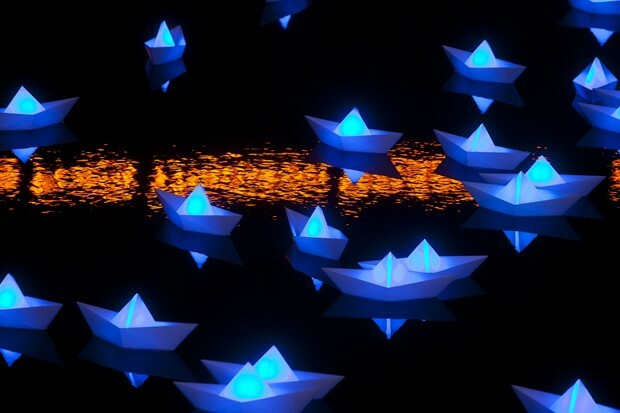 Aether & Hemera’s projects in public space include Voyage, initially commissioned for Canary Wharf Group’s public art program and then carried out in various cities from 2012; a flotilla of tiny light sculptures, composes an organic matrix that ignites fond memories of childhood pleasures, or it could be conceptually interpreted as a water-borne ‘screen’ of ‘pixels’ responding in real-time to people’s behaviour. 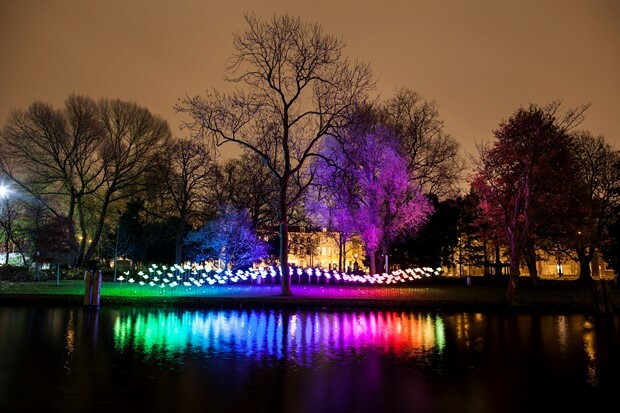 Similarly, people could control On the Wings of Freedom’s lights through their smart phones, during the Amsterdam Light Festival in 2014 and subsequently to 11 different cities across the globe. In 2017 Ronchi collaborated with mathematicians Dr Lombardo and Dr Huard from Nothumbria University to devise creative workshops for schools inspired by their research on nonlinear waves thanks to a EPSRC, Maths Foresees grant. Also, in 2017 Aether & Hemera were selected to participate in the LUTN Light Lab Art; a residency programme in Blackpool for few nominated artists resident in the North to develop new works, research and exchanges on the theme of light art. In 2018, Aether & Hemera have been selected for creating an artwork to commemorate the end of World War One. HOPE is a light and sound installation, inspired by the life experiences of the people of County Durham to commemorate their hope, humanity and resilience, even in the bleakest of times. 2012- Voyage on Middle Dock, Canary Wharf Public Art, London. 2012- Which is your brass voice?, Pop-up shop, International Brass Festival, Durham. 2012- Growing Forest, historic building, Blinc Digital Fest, Conwy, Wales, UK. 2011- The Colour of Phi, DLI Museum and Art Gallery, Durham, UK. 2017-EPSRC, Maths Foresees grant to collaborate with mathematicians Dr Lombardo and Dr Huard to create an artistic work based on nonlinear waves carried out using facilities at Northumbria University. 2016 - Voyage, winner of the “Top 20 Greatest Raspberry Pi Projects ever made” in the official Raspberry Pi magazine. 2011 - Grants for the Arts by Arts Council England, to develop ‘The Colour of Phi’ light installation, using the concept of the Golden Ratio as a mathematical and aesthetic principle shown at the DLI Museum and Art Gallery, Durham, UK. 2010 - 7 month ‘Connect2’ Residency, to develop an Art Strategy for two new cycle routes in Blyth and Bedlington as well as engaging with the local community. Activities included: touring for two months on a red Art Tricycle; delivering workshops at Northumberland College; delivering an artist talk at the local Community centre. Commissioned by Sustrans and Inspire Northumberland. 2011 - Grants for the Arts by Arts Council England, for R&D of ‘Growing Forest’, an interactive video installation featuring a bespoken software application to render algorithmic-based trees. 2008 - 2 year Scheme "Starter for 10" developed by Wayne Hemingway with Gateshead Council, to provide a free studio space to 10 selected artists . 2008 - 6 month Fellowship, Institute of Digital Innovation at Teesside University, to develop the conversational piece ‘The Mood Chair’. 2011- Two lighting landmarks, Harbottle Park’s main entrances, Newcastle upon Tyne, UK. 2011 - Dichroic glass suspended installation, Selby Hospital, Selby, UK. 2010 - Four 4.5m long dichroic glass suspended installations, Whiston Hospital’s, St. Helen, UK. 2008 - Tree suspended light installations, entrances of Truro Health Park, Cornwall, UK. Ronchi G., Benghi C., 2016, Demo Hour: Pollinators, ACM Interactions XXIII.5, doi:10.1145/2973920. Ronchi G., Benghi C., 2014, Interactive light and sound installation using artificial intelligence, Int. J. Arts and Technology. Vol.7, No.4, pp.377 – 379; DOI: 10.1504/IJART.2014.066456. Benghi C., Ronchi G., 2013, An Artificial Intelligence System to Mediate the Creation of Sound and Light, Proceedings of the Fourth International Conference on Computational Creativity 2013, Sydney, NSW, Australia. Short paper and exhibition artwork. G.Ronchi, 2012, ‘Share Your Inner Rhythm’, HESA Inprint #12, April edition. 2013 - Kinetica Art Fair Catalogue, Kinetica Museum Edition, London. 2013 - Aesthetica Art Prize Anthology, 100 Contemporary Artists. 2012 - The Independent, London Evening Standard, City AM, London Metro, Art Daily, Designboom, Notcot, ThisIsColossal, Fubiz, AAJ Press, Design Week, Artlyst, featuring Voyage in Canary Wharf.